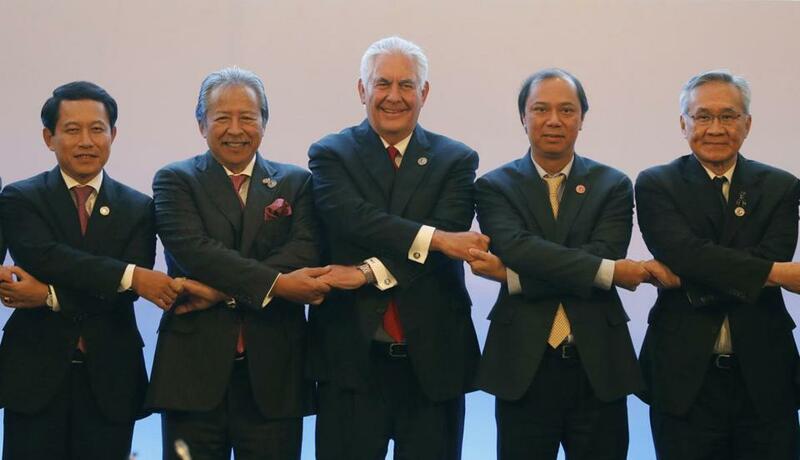 Secretary of State Rex Tillerson (center) joined ASEAN foreign ministers at the ASEAN-US Ministerial meeting in Pasay, a suburb near Manila, on Sunday. MANILA — A day after the United Nations Security Council passed its toughest sanctions against North Korea, Secretary of State Rex W. Tillerson met with his South Korean and Chinese counterparts here in hopes of ratcheting up the pressure on Pyongyang. In a midday conclave on Sunday with Foreign Minister Kang Kyung-wha of South Korea, Tillerson hailed in his typically understated fashion the UN vote, which could cost North Korea nearly $1 billion a year, or about one-third of its foreign earnings. “It was a good outcome,” he said with a smile. Yet the man of the moment at the annual ministerial meeting of the Association of Southeast Asian Nations, or ASEAN, was China’s foreign minister, Wang Yi, a dashing diplomat who unlike Tillerson held a news conference and direct talks with his North Korean counterpart, Foreign Minister Ri Yong Ho. Wang said the two had “an intensive conversation,” and in unusually strong terms, he later urged North Korea to show restraint. “Do not violate the UN’s decision or provoke the international society’s good will by conducting missile launching or nuclear tests,” Wang said. China accounts for more than 90 percent of North Korea’s external trade and has long avoided tough economic sanctions against the North, for fear that a collapse of the government would lead to a flood of refugees, as well as the North’s reunification with the South, putting a close US ally directly on China’s border. A year ago, the Chinese were on their heels in this region. An international tribunal in The Hague last July delivered a sweeping rebuke of China’s behavior in the South China Sea, including its construction of artificial islands, saying its expansive claim to sovereignty over the waters had no legal basis. The case, brought against China by the Philippines, seemed like a turning point in China’s disputes with a host of regional players, including Brunei, Indonesia, Malaysia, Taiwan and Vietnam. A few months before that ruling, 12 nations in the Pacific region concluded more than seven years of negotiations by signing the Trans-Pacific Partnership, or TPP, a trade agreement that bound much of Southeast Asia together with the United States and Japan in an economic partnership intended to fight China’s growing economic hegemony in the region. While China had its own regional trade accord, the US-led pact had become the preferred agreement, with several nations that had missed out on the initial round of negotiations expressing interest in joining. President Rodrigo Duterte of the Philippines, elected last year, has backed down from his insistence that China abandon the shoals at the heart of the tribunal’s decision, preferring instead to accept significant Chinese economic assistance. With the Philippines serving as host to ASEAN, the country’s about-face lifted a significant cloud over China, with only Vietnam reportedly continuing to insist that the group condemn Beijing’s actions. Instead, ASEAN and China adopted a fairly weak negotiating framework for a code of conduct in the South China Sea — several steps removed from anything that could force China to abandon its territorial claims or give up the seven islands it built in disputed waters, three of which have runways and military hardware. Wang said adoption of the framework created a solid foundation for negotiations that could start this year, if “the situation in the South China Sea is generally stable and on the premise that there is no major interference from outside parties,” according to Reuters. Few believe the framework will lead China to a binding agreement anytime soon. Perhaps even more important, President Trump renounced the TPP. That action, along with his years of denunciations of the trading policies of Japan and China and a promised “America First” pivot, seemed to many in the region to represent a significant retreat by the United States from its military and economic engagement here, and an important victory for China. Barack Obama had lavished attention on the region, which has a population of more than 620 million and a collective economy of about $2.4 trillion, the third-largest in Asia, after those of China and Japan. Astride the world’s busiest and most strategic shipping lanes, the region was the fulcrum of the administration’s rebalancing toward Asia. Trump has yet to demonstrate a similar interest or commitment to the region. And while he did not meet with journalists Sunday, his top diplomat for the region, Susan Thornton, said that multiple visits by top administration officials had demonstrated its continued importance to the United States.